Aces hold the strongest, purest energy of the Suit's attributes, and really they are this beautiful convocation of Universal/Divine energy and personal fire and energy. They are the seed of inspiration, the absolute nugget of potential to be whatever you want to make it. Of course, with each suit, the Ace holds the intent, the Highest manifestation of the element's expression. The Ace of Pentacle represents a new job, with new growth, possibility, achievement, for example. The Ace of Wands might hold a new passion, creative project or dynamic expression--a new fire in one's belly. Pamela Coleman Smith chose to represent the Ace as a gift from the Divine, depicted on each Ace as a hand coming from Heaven--the Hand of God, so to speak. Marcia Masino sees this hand harkening to Michaelangelo's Sistine Chapel painting of God creating Adam, or rather the representation of the Creative Principle. Still others see this hand as the Magician's hand, as the Magician is the Key number I in the Major Arcana, and his genius and reigning talent is the use of all the Elements for his good. Certainly, most people do see the Aces as bridging the energy of the Major Arcana with the Minor Arcana, and I love the idea of the Magician reaching from Major to Minor, from the heavenly or spiritual concerns of the Major Arcana to the earthly concerns of the Minor Arcana. So, whether you see this hand as the hand of the Magician or the hand of God, the Universe, Great Spirit, Creator, or Source Energy, this hand endows you with all the potential that the suit carries. Or the Magician (or your Higher Self) manifests it for you, if you want to see it that way. It is the seed. The root. The spark of life. Of course, the responsibility to take action on this energy and exploit it falls on the Seeker. One must take advantage of this energy. As Margaret Atwood said, "Potential has a shelf life." And thus, this Ace energy also has a shelf life. It is the opening of a door, the beginning of a new phase. The phrase, "God will move mountains, but you need to bring a shovel" comes to mind here. 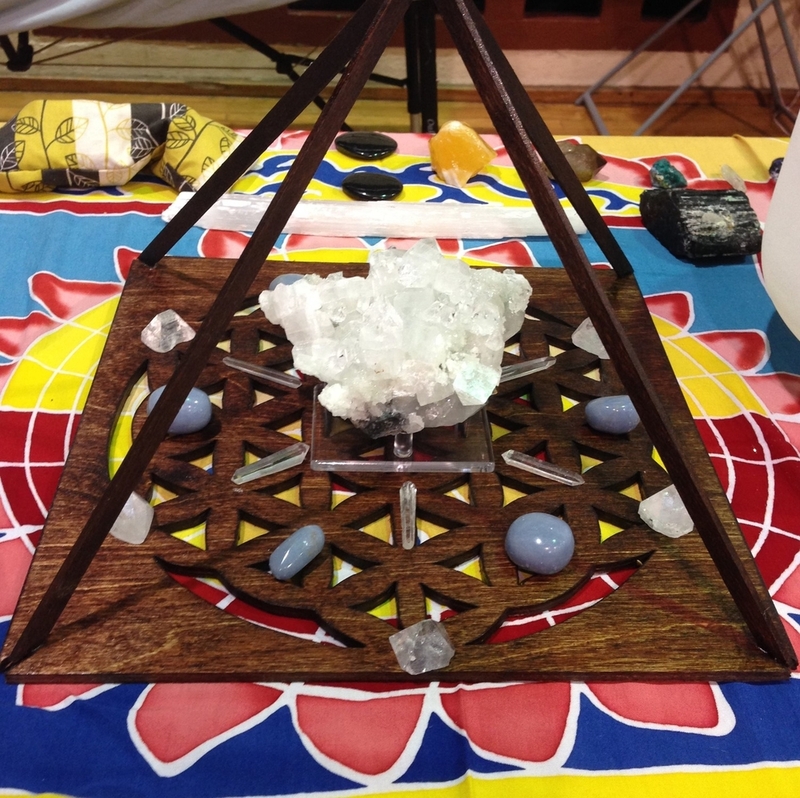 As it holds the energy of the numerological aspects of One--new beginnings, opportunity, potential. The latter idea of potential is where Aces hold their greatest assets--they make all potentials possible. The only limit to their achievement is your failure to dream large enough. You are blessed in a new beginning, but you must work to realize it on the earthly plane. Aces carry such power in the Minor Arcana suits that some Tarot readers pull them out of the reading and place them above the reading itself. Exalting the Ace, as it is called, is a way to show the amazing influence of this card in terms of every other card in the reading. What was done is the Ace was literally pulled out of the reading and placed above the entire layout, replaced in that position with another card. Much like the Nine of Cups, the Wish card, the Ace kisses the forehead of every card in every position. It is almost as if the Reader must put on Ace colored glasses here and read through the lens of a new beginning, new potential, and manna from heaven. I'm talking about Aces as a whole here, because the Aces warrant their own discussion. The symbology and character of the Aces are all very similar, though they take on the nuance of their suit/Element. Each of the Ace cards have limited symbology in terms of deeper meanings, myth and archetypes. They simply show the suit's potential. They are always positive, and so the Ace of Pentacles (the reason we are talking about Aces today at all) depicts a lush and fertile garden, representing both the need for hard work to get desired results. The hand is also holding a golden coin, representing the accumulation of wealth or the gift of money. Sometimes this card appears in a reading when the Seeker has received a small (or large) sum of money--a stipend, a gift, an inheritance (this often comes with the Ten of Pentacles somewhere else in the reading, though), a settlement, a severance package, or something like that. It can be the seed for a new business or project. Most often this comes when someone has just started a new job, or moved to a new home. 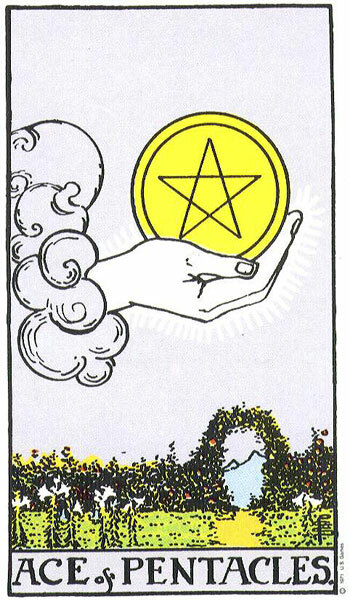 But truly, above all other distinctive meanings, the Ace of Pentacles is the card of abundance and manifestation of material, if that is what you are going for. When paired with other Aces, you must think of the way the power of Pentacle is expressed with the power of the other element. So, for example, if the Ace of Pentacles appears with the Ace of Wands, it might mean the Seeker is starting a new creative project or career. With the Ace of Swords, it might mean the person is going to be in a successful speaking engagement, using his communication skills to succeed. Aces reversed are a warning. They still contain the Divine spark, energy and power of the Ace upright, but they warn the Seeker to use this power for good, not for selfish or self-serving ends. Perhaps I should have just left this as a discussion on Aces, but as I delve deeper into this blog, I find myself wanting to draw more connections for you as Readers yourself and explain more of the interconnectedness of the cards, symbols and how to apply these interpretations in full readings.